US President Barack Obama meets with top advisers Friday to discuss the "next steps" to stem a giant sea of oil lapping the fragile Gulf Coast as BP readied its latest make-or-break bid. Obama, who the White House has described as "deeply frustrated" that the leak has not been plugged three weeks since a spectacular explosion rocked an offshore drilling platform, has increased pressure on rig-operator BP as officials warned the oil could hit more coastal states over the weekend. The British oil giant meanwhile prepared a new attempt to siphon the crude up to a tanker on the surface as serious questions emerged over exactly how much oil is gushing into the Gulf of Mexico. 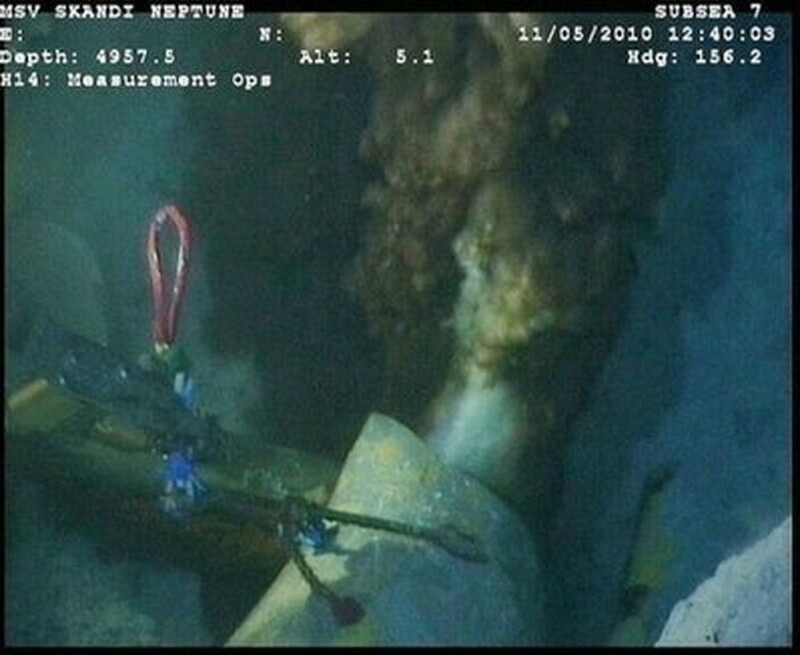 Remote-controlled submarines were set to perform the delicate operation to insert a narrow six-inch (15-centimeter) diameter tube into the main leak in a 21-inch thick riser pipe in inky depths 1,500 meters (5,000 feet) down on the seabed. This image released by BP on May 11 shows the main oil leak (R) of the Deepwater Horizon rig which exploded April 20 and killed 11 workers. "There will be a set of gaskets attached to the tube and they will help seat it in the riser pipe," BP spokesman Bryan Ferguson said. Success could see most of the leaking oil contained and allow BP to concentrate its efforts on mopping up the giant slick, which the National Oceanic and Atmospheric Administration forecasts would not make landfall in Florida, Mississippi and Alabama until late Saturday. Louisiana's fragile shores have been the hardest hit by the growing pool of oil so far. BP is facing a growing backlash as experts warned the spill may actually be at least 10 times worse than the US Coast Guard's official estimate that 5,000 barrels (210,000 gallons) of crude are gushing from a ruptured well each day. Scientists analyzing video of the leak released by BP told CNN and National Public Radio that the leak was actually spewing closer to 70,000 barrels (294,000 gallons) a day, with an estimated margin of error of plus or minus 20 percent. The findings suggest the gulf spill is already the worst environmental disaster in US history, having eclipsed the 1989 Exxon Valdez spill. But BP has disputed the results, saying there is no reliable method to calculate how much oil is flowing from the broken pipe. The Deepwater Horizon rig, leased by BP from Transocean, the world's largest offshore drilling contractor, sank on April 22, two days after a massive explosion that killed 11 workers. BP is under fire after congressional hearings on Tuesday and Wednesday revealed multiple warning signs were perhaps overlooked before the April 20 blast. Top oil executives from BP, rig owner Transocean and Halliburton, which was being paid to seal the well, traded blame over the disaster. One of the main questions is why BP or Transocean decided to go ahead with final operations to seal the well despite a test that apparently indicated highly combustible gas could still be leaking out. Citing accounts by two contractors, The Wall Street Journal said a decision was also taken to conduct the final operations in reverse, meaning the drilling "mud," or lubricant, was withdrawn before a final cement plug was inserted. Engineers have been mulling several different options to seal the main leak and prevent a giant slick from destroying vulnerable coastlines. Engineers decided to use the insertion tube method rather than a "top hat" containment box because they were concerned ice-like crystals that dogged efforts last weekend would form inside the structure. BP is also contemplating a bizarre "junk shot" maneuver to jam up the blowout preventer (BOP) with golf balls, tires, rope and other debris. It began drilling a relief well on May 2 that could divert the flow until the well is permanently sealed, but this may not be ready until August. Louisiana's 2.4 billion dollar fisheries industry has already been hit by a ban on fishing and shrimp harvesting in a large swath of coastal waters. Cleanup teams are seeing oil wash up on island nature reserves in Louisiana and National Guard troops have been scooping up tar balls off beaches on Dauphin Island, a popular Alabama tourist spot. Transocean, which BP is blaming for the failure of the blowout preventer, filed a petition in a US court Thursday to limit its liability in the spill to 27 million dollars. US senators from the three US western Pacific Coast states introduced draft legislation calling for a ban on new offshore drilling near their shores.